How much would you spend on a burger if you absolutely love burgers? Maybe a couple of thousands? But a restaurant in Tokyo is offering such a special edition burger that it may cost some their entire salary of a month or two! Rightly tagged as the world's most expensive burger, it comes with gold dusted buns and costs £700 ie Rs 63,000! Sold at Oak Door steakhouse in Tokyo, this exclusive fast food offering was made to mark the beginning of Reiwa era in the country. Priced so expensive, the Golden Giant Burger assures a huge quantity too. It has 1 kg patty, Wagyu beef slices, foie gras (a luxury paste made from duck of goose liver), shaved truffle, lettuce, cheddar cheese, tomatoes and onions. It is about 6 inches wide and 10 inches tall! And the final element to it is the sprinkled gold on its buns. This special burger, more like a dedicated dish is made to celebrate the crowning of the new Japanese emperor, Crown Prince Naruhito. It is the creation of chef named Patrick Shimada, who works at the restaurant. 24K Gold Plated Ice-Cream is Finally in India! View Pic of The Mighty Midas Dessert. It is indeed huge to its name and made to make the huge news of the era change in Japan. Talking about it chef Patrick says on the hotel website, "As a fourth-generation Japanese, I am honored to witness this exciting time of change in Imperial era while working in Japan. While I was thinking how I could contribute to this once-in-a-life-time opportunity, I came up with this idea of Golden Giant Burger." Getting a taste of this burger is not as easy. Anyone who wants to taste this piece of exquisite luxury will have to place an order at least 3 days in advance. This burger will be on the restaurant's menu till the month of June. 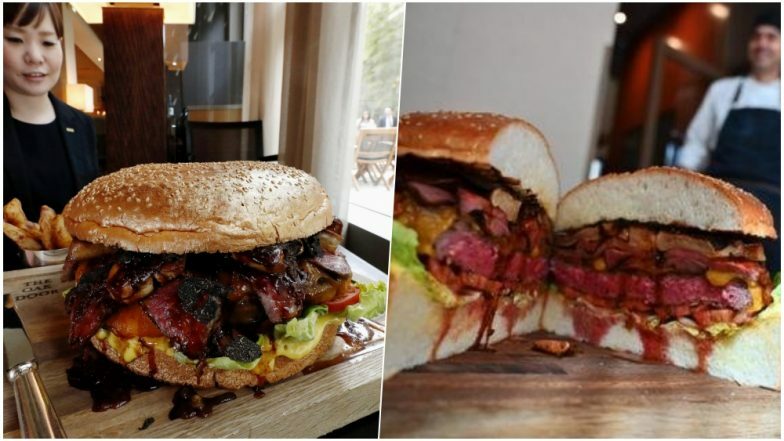 So if you are die-hard burger fan and also have a heavy appetite, you might want to head to Tokyo to boast of eating the world's most expensive burger.